If you had four products or services, how much money should you spend on each? Should you double-down on the one product or service that’s making all the money? It may not be obvious, but the answer is no. Allow me to show you why. Where should your money be going? Then, you can decide where to direct your marketing spend. Let me explain this in a little bit more detail. In itself, this isn’t a contentious idea. But think about size, growth, profitability, competition, and barriers to entry. Barriers, by the way, are always a good idea, because you want high barriers to protect you. All of these factors make some markets more attractive than others, and you should spend more on the more attractive markets. Easy so far, right? 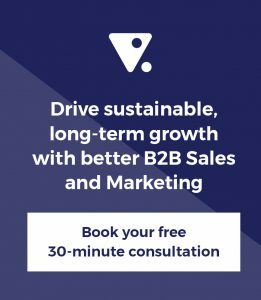 So, we’re thinking about strength as being some combination of your market share and if you’ve got a compelling, unique sales proposition that the market recognises. And we ought include whether you’re able to create a product or service for less than it normally costs to make that product. That is, whether you’ve got a cost advantage for one of your products. Finally, have you got past success that you can draw on? Collectively, some of your products and services perform stronger than others, and the ones that aren’t performing probably need more of your money. This is what BCG’s growth share metrics call your ‘Cash Cow’. You’ve already fed it, now it owes you some milk. 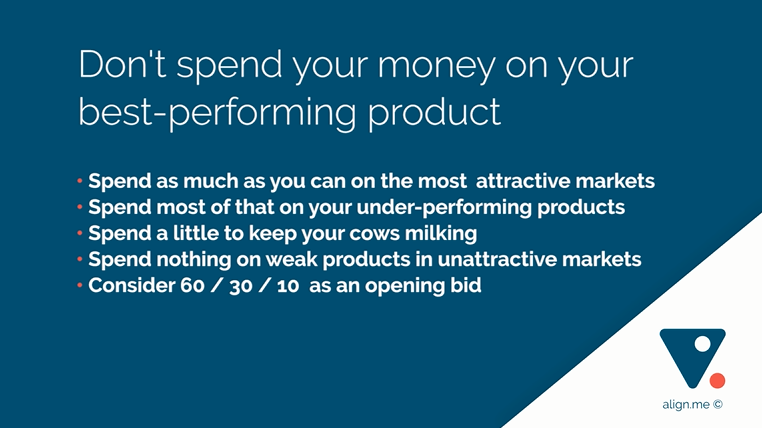 The cash cow is the product or service that’s already making good money for you, and it’s in a market that’s mature or declining – it’s maxed out. So you don’t really need to spend a lot of money on it because it’s already strong, and it doesn’t deserve your marketing spend because it’s not in a growth market. This one’s easy – if you’ve got a weak product or service in an unattractive market, cut your losses. Consider 60/30/10 as an opening bid. 60% of your money should be spent on an attractive market where you’re not already yielding a strong performance. 30% in an attractive market in which you’re strong and want to remain so. 10% in a market where you’re already in a strong position, but it’s not such an attractive market. And nothing in the unattractive market where your performance is weak. This 60/30/10 is not a rule or a law, but it’s a great starting point. What are the markets that we’re going to pursue? What are the offerings we’re taking to those markets? What problem are we solving for the market? And then we need all of the tactics to execute or affect that strategy. 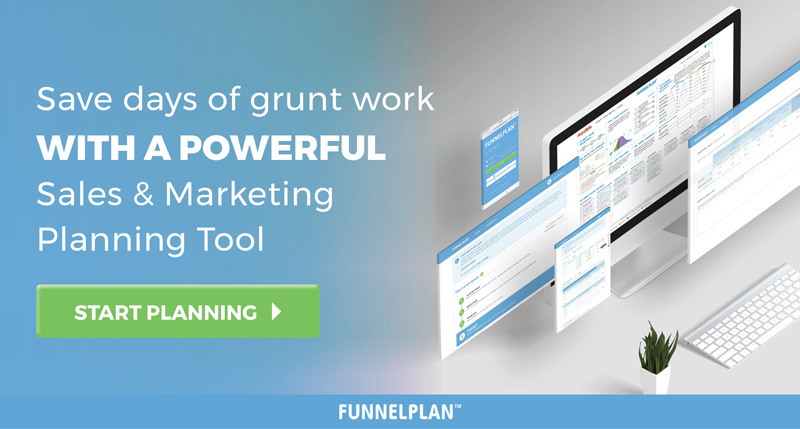 We need Sales, Marketing, Finance, and Operations to agree on the strategy and the tactics, and that’s the role of the Funnel Plan. It can help you answer all of those questions and then communicate your answers to those questions. Now, if you have a Funnel Plan already, you know what I mean. If you don’t, go get one at Funnelplan.com. I hope you got lots of value out of today’s Funnel Vision Blog. We’ll have a new blog up next month in the same place. Until then, may your funnel be full and always flowing.